Chlorella is a green single cell algae and an excellent source of protein that is easily digested. Chlorella has many benefits to assist in the achievement of optimal wellbeing because it helps the body to get more out of vitamins and minerals and is helpful with blood sugar regulation, for both hyperglycemic and hypo-glycemic episodes. It is a high-quality concentrated food for supplement that also enhances immune health. The best long term strategy to cut cravings is to deliver a high amount of nutrition on an ongoing basis, over time, your cravings nearly disappear. Chlorella stabilises blood sugar levels, effectively allowing you to gain nutritional value while losing your cravings for empty calories. There are many species of chlorella which grow naturally in a fresh water environment. 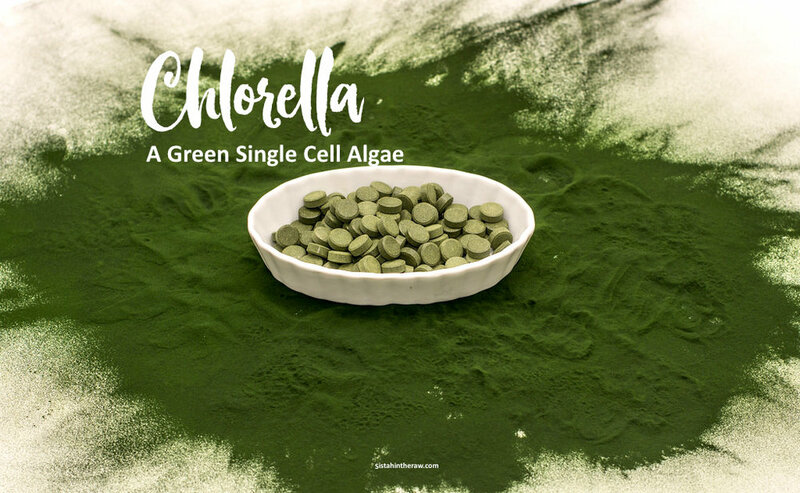 Some algae (water plants) like chlorella are tiny microscopic organisms, and there are well over 25,000 known species of algae, which is said to be responsible for 90% of the photosynthesis on the earth. It's that old, that fossilised algae can be dated back to more than 1.5 billion years, plus it's said to be the first link in the food chain! Traditionally chlorella has been used for promoting the normal function of the immune system and the high yield of chlorophyll has been thought to be a natural detox/cleanser, because it also helps to maintain a normal colonic function. Chlorella's high antioxidant power protects your cells from ‘free radicals’ that cause DNA damage and can lead to cancer. Taking Chlorella supplements can help you to draw out and detoxify your body of some seriously nasty toxins, like metals consumed in fish that could be damaging your body. You can ensure that you get a number of vital vitamins and minerals that your body needs for optimum functioning, these include vitamin A, vitamin B, vitamin C, vitamin E, potassium, calcium, phosphorus and iron! It also contains good amounts of vitamins B1 and B6. Most excitingly, taking chlorella has been proven to lower levels of both blood sugar and cholesterol! It greatly speeds up the movement of your food through the gastrointestinal tract, and can therefore reduce the absorption of fats into the bloodstream. Studies have given scientists reason to believe that the algae activates genes at a cellular level that can improve your sensitivity to insulin, encouraging a health balance in your body. So this is potentially a fantastic aid for treating type 2 diabetes. Adding chlorella to your diet couldn't be easier and you'd want to because it's also more nutrient-dense than super greens like kale, spinach and broccoli. So here are some easy ways to add chlorella to your diet. Chlorella is at its best in pure powder form, from a pure source, but tablets are also acceptable if you can't find a way to enjoy chlorella. Typically the maintenance dose for chlorella is 3-6 grams per day. Some people may find they need to start with a smaller dose of chlorella and gradually increase it until their body adjusts to this whole superfood. You can start with as little as 500 mg per day. Add a to your green juice. Add to sauces, dips and pates. Unlike spirulina, chlorella is a complete unicellular organism, and the richest source of chlorophyll on earth. Although while both are natural algae, spirulina contains a blue green pigment and chlorella is emerald green. Chlorella only grows in fresh water, which means that unlike sprirulina, it contains little or no salt or iodine. Spirulina is also well known for its yield of fats and proteins and is considered to be good for fighting disease. Chlorella is a powerful food supplement. If you have been advised to undertake a detox protocol, chlorella is of great addition to that process. Known for it's detoxifying nature and ability to nourish the immune system, to improve insulin sensitivity and blood sugar levels over time, it is rich in natural carotenoids and it may also benefit those with high blood pressure.